Streamlined Jocks are "the basic jocks". They are based on the "new design" Lawn Jockeys from the late 1940's... built for a faster world- and are a simpler, more "modern" version of our Original Jocks from the "horse and buggy days". 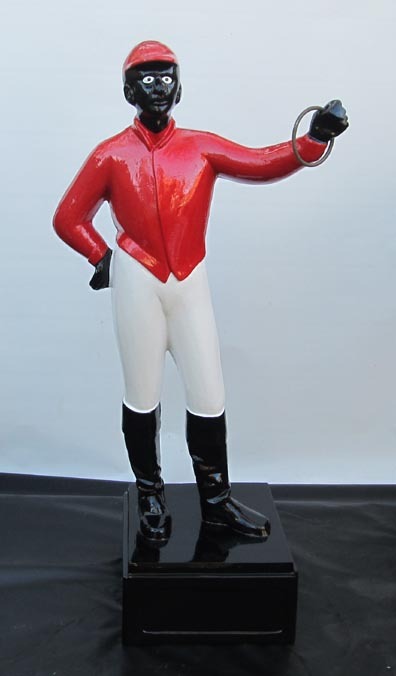 When lawn jockeys reemerged as yard art(instead of hitching posts) after World War 2, many adopted a new "streamline moderne" or "art deco" look borrowed from popular architecture and automobiles of the period. Painting schemes deleted ornament in favor of "aerodynamic line and form". 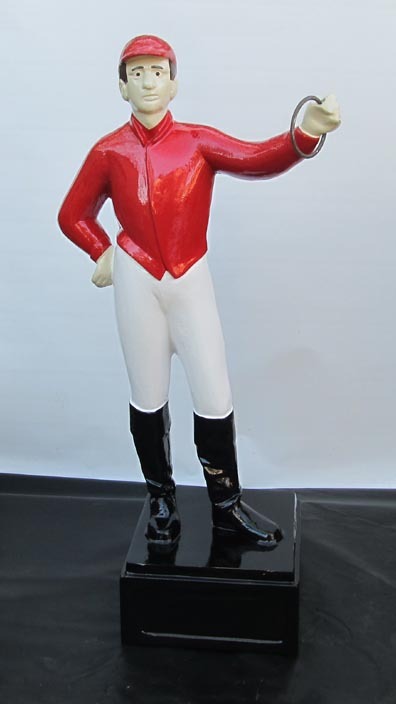 This redesign also complemented the lawn jockey's new function as yard art that is mainly viewed from a distance of several yards instead of "up close and personal" as a hitching post. Of course, the view of yard statuary passing on the street in a car driving 25 mph is a lot different than in a horse and buggy at 5 mph! 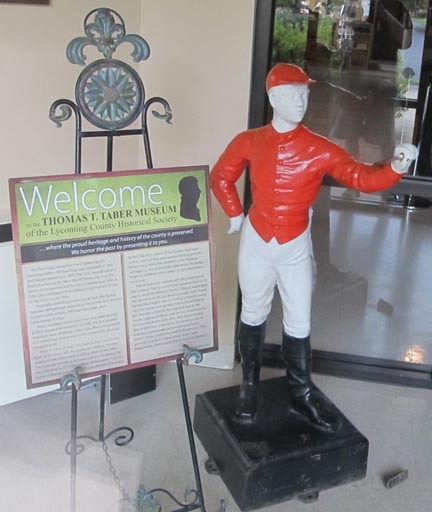 When jockeys were moved from the street to the stoop, glass eyeballs and facial features were discarded in favor of minimal detail- while retaining the basic design that makes the statue "an American icon". 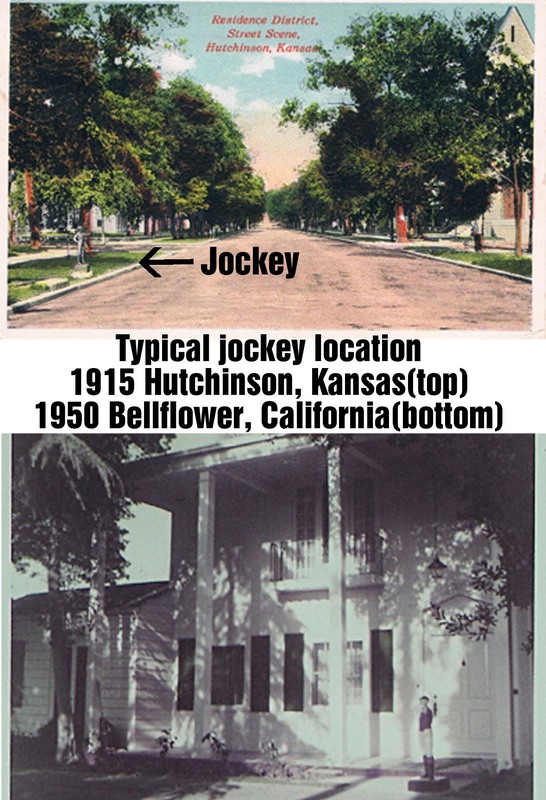 Postcard and black and white photo showing typical Lawn Jockey installations in 1915 and 1950. Click on picture for larger view. The biggest advantage of a simpler paint configuration is that the jockey statue is easier to paint and maintain. Paint jobs on streamlined lawn jocks were typically limited to 3 colors: black, red, and white. Cast iron streamlined jock at entrance of Williamsport, PA museum. 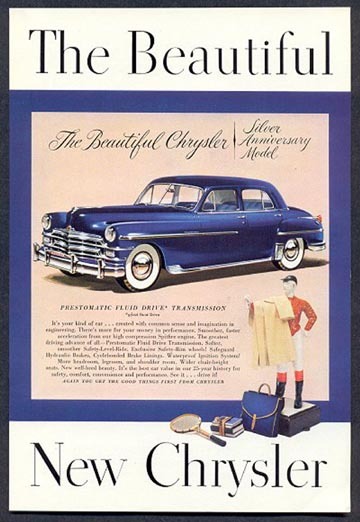 "Not your grandpa's hitching post" : The streamlined jock was quickly adopted in car advertising and by service businesses like motels and restaurants, emerging as a new universal symbol of "welcome home". 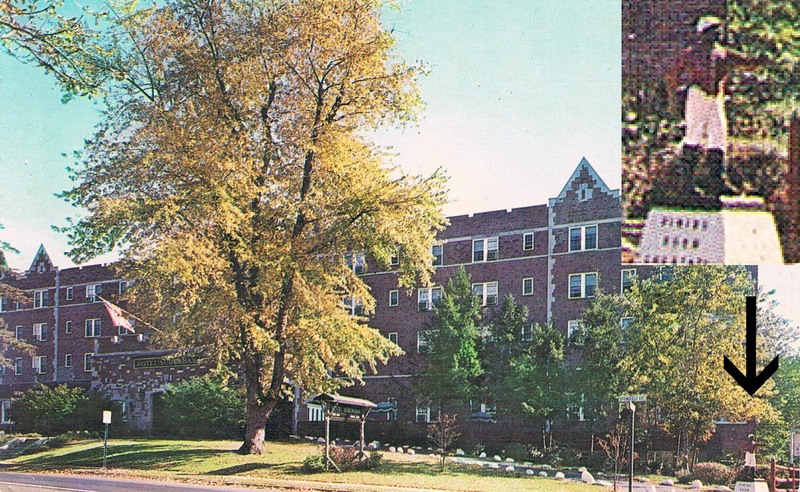 Above: Streamlined black-face jock at entrance to Hotel Suburban, Summit, NJ. Click on picture for larger view. A break from the past: "It's your kind of car... created with common sense and imagination"... just like the lawn jockey. The timeless design of the jockey looks just as great next to the new "horseless carriage" as it did next to the horse and buggy! Our version of a "streamlined jock" is a simplified version of our "Original Jock"- with all the important and charming features retained and unnecessary features deleted. We decided to keep the basic facial details painted on since they are minimal to begin with. The form is smooth with fewer wrinkles for easier painting, and the green on the top of the base and brown boot tops are replaced with black paint. Just like the "Original Jock", Streamlined Jocks come in 2 versions: white-face and black-face. 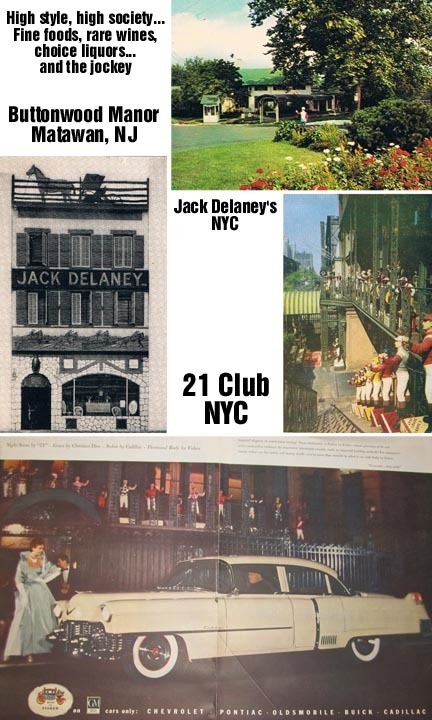 there are more jockeys at the entrances to mansions, race tracks, bars and restaurants in 1948 than in 1878! Click on picture for larger view. Each of our Streamlined Jocks are artistically painted in heavy-handed brush strokes with thick, contrasting colors of paint. The statue arrives fully painted and fully assembled- just pull him out of the box and put him on the stoop! A ring is included for the Streamlined Jock's hand, but these Jocks also work well with our optional oil and solar lanterns(lantern sold separately- CLICK HERE for more information).